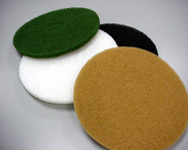 Pads are mainly used with polisher or buffing machines to apply Synteko Natural. Oil or for cleaning of timber floors. An additional feature is the support function for mesh screens, cloths or rags.